In the old days, there used to be competition among brick and mortar stores like Macy's, Gimbels, Sears and E.J. Korvette's. Now, there is extremely fierce battles between discount stores like Walmart and online retailers like Amazon. Of course, back in the days of Korvette's, a smartphone would have been considered magic. A device that fits in the palm of your hand that could make phone calls would have seemed hard enough to believe, but throw in all the media content and data that today's smartphones bring to you, and the speeds at which this information becomes available in the palm of your hand, and it all would seem like science fiction. Which brings us to the device that many consider the best Android handset ever made to date, the Samsung Galaxy S II. Just this morning, we told you that the phone, launched today at AT&T for $199.99 with a 2-year contract, had been discounted $50 at Amazon. But before you start to type out the URL on your phone or PC, better grab your keys instead. 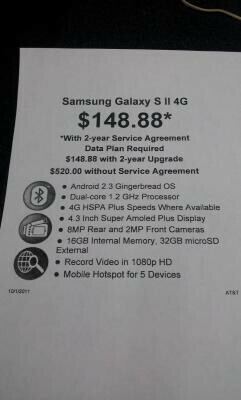 A picture of the product card for the AT&T version of the Samsung Galaxy S II shows that Walmart is undercutting Amazon by selling the phone for $148.88 with a qualified data plan. So the question is whether or not the difference of $1.11 is worth it to get in the car, use up some gas and some of your time to drive to Walmart instead of ordering the phone from Amazon in the comfort of your home. Considering that driving to Walmart would mean holding the phone in your hand today instead of waiting for a shipment from Amazon, we would tell you to take the drive. "Tax"????? Are you serious??? Taxes are not company specific,. They are determined by the address where the item is shipped/where you live. That means that you would face the same taxes either way buddy. Every company legally authorized to sell anything in this country require sales taxes... Look it up. Retailers like Amazon and Newegg doesn't charge tax for us Texan, how's that for a change? Anyone know if you keep a grandfathered unlimited data plan when you upgrade at Walmart? Yeah, I know at the Walmart where we work which shouldn't be any different, if you are grandfathered in under AT&T or Verizon you are allowed to keep it. Just make sure that they have a good staff at your Walmart and they know what there doing, I've heard so many horror stories about peoples plans getting switched or features getting deleted or added because people at other Walmart's not knowing what they are doing. Well if I were you I wouldn't risk letting someone at Walmart mess that all up. I sure as heck didn't want to take the risk and it was worth more then 50 bucks to me to keep my current unlimited data plan, so I said screw the 50 bucks and just went straight to AT&T. WOW... $1.11... 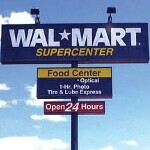 I know it cost more to write up this article than the savings that Wal-Mart offers over Amazon. Yeah, PhoneArena's nice like that. So people like you and me can be well informed and save time + money. Why not? Its a one stop place for a rifle, ammo, Budweiser, bait, and the best cotton picking Android phone this south of the Mason Dixion Line for the Southern Gentlemen! At least your cashier isn't a hipster douche with Real 3D glasses with popped out lens. As I reported this morning, I went to my local Wal-Mart (and I live in a SMALL town in Georgia) early this morning and they had the Galaxy S II for $148.88 with a contract.